The feature packed Duchess set is a must have for anyone with a taste for the romance of rail. Conceived by the office of Sir William A. Stanier FRS, the Duchess is a classic example of British engineering at its finest. Classic Cabon City is a large city with over 180 stations and a two-track system enabling full choice in the route to your destination. Build And Operate The Railroad Of Your Dreams....With Your Friends! 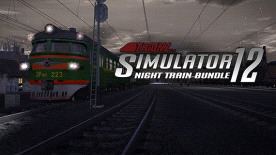 Trainz Simulator 12, Now With Multiplayer.